(Nanowerk News) An implantable, microchip-based device may soon replace the injections and pills now needed to treat chronic diseases: Earlier this month, MIT spinout Microchips Biotech partnered with a pharmaceutical giant to commercialize its wirelessly controlled, implantable, microchip-based devices that store and release drugs inside the body over many years. 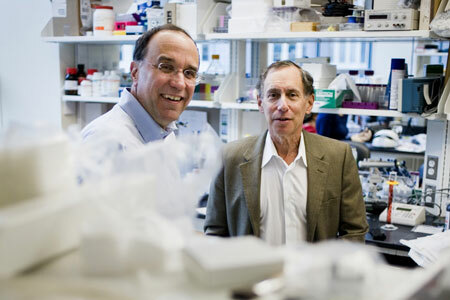 Invented by Microchips Biotech co-founders Michael Cima, the David H. Koch Professor of Engineering, and Robert Langer, the David H. Koch Institute Professor, the microchips consist of hundreds of pinhead-sized reservoirs, each capped with a metal membrane, that store tiny doses of therapeutics or chemicals. An electric current delivered by the device removes the membrane, releasing a single dose. The device can be programmed wirelessly to release individual doses for up to 16 years to treat, for example, diabetes, cancer, multiple sclerosis, and osteoporosis. Now Microchips Biotech will begin co-developing microchips with Teva Pharmaceutical, the world’s largest producer of generic drugs, to treat specific diseases, with licensing potential for other products. Teva paid $35 million up front, with additional milestone payments as the device goes through clinical trials before it hits the shelves. Apart from providing convenience, Microchips Biotech says these microchips could also improve medication-prescription adherence — a surprisingly costly issue in the United States. A 2012 report published in the Annals of Internal Medicine estimated that Americans who don’t stick to prescriptions rack up $100 billion to $289 billion annually in unnecessary health care costs from additional hospital visits and other issues. Failure to follow prescriptions, the study also found, causes around 125,000 deaths annually and up to 10 percent of all hospitalizations. While its first partnership is for treating chronic diseases, Microchips Biotech will continue work on its flagship product, a birth-control microchip, backed by the Bill and Melinda Gates Foundation, that releases contraceptives and can be turned on and off wirelessly. 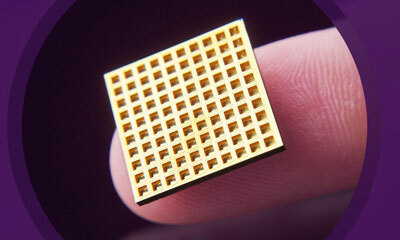 A version of Microchip Biotech's implantable, wirelessly controlled microchip. When an electrical current is delivered to one of the chip's tiny reservoirs, a single dose of therapeutics is released into the body. Inspiration for the microchips came in the late 1990s, when Langer watched a documentary on mass-producing microchips. “I thought to myself, ‘Wouldn’t this be a great way to make a drug-delivery system?’” Langer says. This dime-sized prototype contained only 34 reservoirs, each controlled by an individual wire connected to an external power source. At the time, they considered a broad range of practical, and somewhat fantastical, applications beyond drug delivery, including disease diagnostics and jewelry that could emit scents. “We were trying to find the killer application. We thought, ‘I have a hammer, what’s the right nail to hit?’” Cima says. For years, the technology underwent rigorous research and development at Microchips Biotech. But in 2011, Langer and Cima, and researchers from MicroCHIPS, conducted the microchips’ first human trials to treat osteoporosis — this time with wireless capabilities. In that study, published in a 2012 issue of Science Translational Medicine, microchips were implanted into seven elderly women, delivering teriparatide to strengthen bones. Results indicated that the chips delivered doses comparable to injections — and did so more consistently — with no adverse side effects. That study, combined with ongoing efforts in contraceptive-delivery microchips, led Cima to believe the microchips could someday, essentially, be considered the first artificial glands that could regulate potent hormones inside the body. Microchips Biotech made several innovations in the microelectromechanical systems (MEMS) manufacturing process to ensure the microchips could be commercialized. A major innovation was enabling final assembly of the microchips at room temperature with hermetic seals. Any intense heat during final assembly, with hermetic sealing, could destroy the drugs already loaded into the reservoirs — which meant common methods of welding and soldering were off-limits. To do so, Microchips Biotech modified a cold-welding “tongue and groove” process. This meant depositing a soft, gold alloy in patterns on the top of the chip to create tongues, and grooves on the base. By pressing the top and base pieces together, the tongues fit into the grooves, and plastically deforms to weld the metal together.